CONNECTICUT JUNIOR MIDDLEWEIGHT Edwin Soto, right, unloads on Ray Oliveira Jr. during their Feb. 23rd bout in Rhode Island. 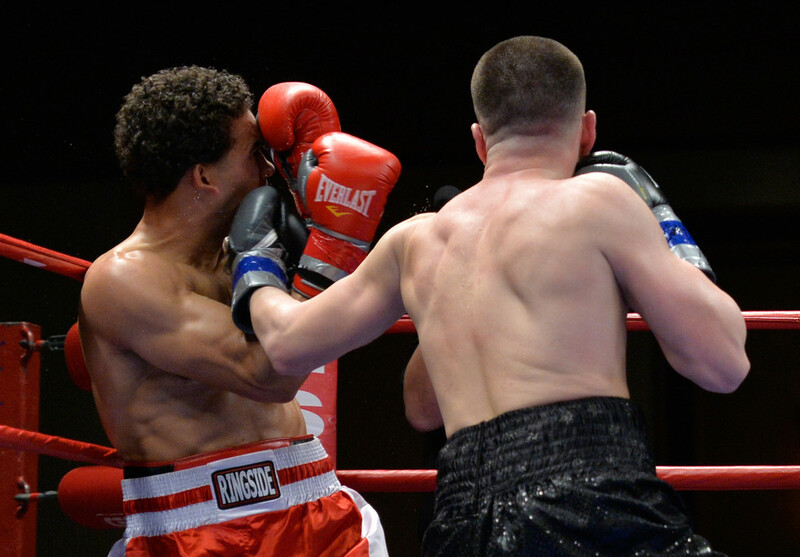 Soto won by second-round knockout and returns to the ring Saturday, June 2nd, 2018 in the main event of CES Boxing’s pro-am card at Foxwoods Resort Casino in an eight-round bout against Brooklyn’s Salim Larbi. The headliner is one of seven pro bouts on the card, which is preceded by a loaded amateur lineup to launch Jimmy Burchfield’s USA Amateur Boxing Tournament. The main card also features New Haven, Conn., welterweight Jimmy Williams and Sicilian heavyweight Juiseppe Cusumano, who enters on a 13-fight win streak. NEW HAVEN, CONNECTICUT welterweight Jimmy Williams returns to Foxwoods Resort Casino for the first time since August when he faces Jose Antonio Abreu in a six-round bout Saturday, June 2nd, 2018 on the undercard of CES Boxing’s pro-am event at the Fox Theater. MASHANTUCKET, Conn. (Thursday, May 24th, 2018) — Fresh off the biggest win of his career, New Haven, Conn., junior middleweight Edwin Soto returns to his home state for the first time in more than three years to face his toughest opponent yet. Soto (12-2-2, 5 KOs) headlines the Saturday, June 2nd, 2018 pro-am boxing event promoted by CES Boxing at Foxwoods Resort Casino’s iconic Fox Theater in an eight-round regional showdown against 31-fight vet Salim Larbi (20-9-2, 7 KOs) of Brooklyn, N.Y. The eight-round Soto-Larbi showcase is one of seven professional bouts on a stacked lineup also featuring the official launch of Jimmy Burchfield’s USA Amateur Boxing Tournament with six exciting amateur bouts on the preliminary card. The amateur bouts begin at 6 p.m. ET with the professional main card beginning at 7:30. “This is an exciting night of amateur and professional boxing and we’re proud to bring this event to the beautiful Foxwoods Resort Casino,” CES Boxing president Jimmy Burchfield Sr. said. “The young, hungry amateurs you see on June 2nd will one day grace that same stage as professionals. It’s honor to help them along their paths to world championship glory. Tickets for the June 2nd event, titled “The Future Is Now,” are priced at $37, $47, $77 and $157 (VIP) and can be purchased online at www.cesboxing.com, www.foxwoods.com, or www.ticketmaster.com; by phone at 401-724-2253 or 800-200-2882 or at the Fox Theater Box Office. Soto steps back into the ring for the second time in four months after shocking Ray Oliveira Jr. of New Bedford, Mass., in a second-round knockout win in Rhode Island on Feb. 23rd. Oliveira Jr. entered the bout 8-1 while Soto had only fought once since 2015, but the Aguadilla, Puerto Rico native rocked Oliveira Jr. in the opening round and finished him for good in the second, punctuating the most impressive win of his career to capture the vacant WBU Canadian American Mexican title. The Foxwoods stage is nothing new to Soto. The 27-year-old earned his third and fifth professional wins at the Fox Theater under the promotional guidance of CES Boxing and raced out to a 9-0-2 record before suffering his first career loss in October of 2013. After beating Shakha Moore in an intrastate showdown in 2015, Soto took two years off to refocus and returned triumphantly in October of 2017 with a win over Anthony Everett in Massachusetts. Born in Nord, France, the 31-year-old Larbi has faced the best of the best in the junior middleweight division. The record of his last four opponents is an impressive 60-1, including 2012 Olympic silver medalist Esquiva Falcao and Boston’s Mark DeLuca. The well-traveled 5-foot-10 junior middleweight now fights out of New York under the promotional guidance of Ronson Frank’s Uprising Promotions. Over the past six years, Larbi has fought in France, Algeria, Canada, Germany and the United States. Also returning June 2nd, New Haven’s Jimmy Williams (14-1-1, 5 KOs) faces Jose Antonio Abreu (13-4, 8 KOs) of the Dominican Republic in a six-round junior middleweight bout and Sicilian heavyweight Juiseppe Cusumano (15-1, 13 KOs) put his 13-fight win streak on the line in a six-round bout against Michigan’s Robert Simms (6-2, 3 KOs). Cusumano extended his streak May 11thin Rhode Island, surviving an early scare against southpaw Bernardo Marquez before earning the win via fourth-round knockout. The hard-hitting heavyweight has knocked out each of his last nine opponents, including a first-round knockout win over Robert Dunton in his Foxwoods debut in August. The heavy-handed Simms recently chopped down Curtis Head in Dearborn, who entered their bout 4-1, and went toe-to-toe with former two-time international champion Alexey Zubov and 6-foot-5 Detroit heavyweight Craig Lewis. Williams is back home after facing Marquis Taylor in Nevada in April. He is 4-0 lifetime at Foxwoods and 12-0 fighting in the state of Connecticut. June 2ndis his first fight at Foxwoods since a controversial no-contest against Issouf Kinda in August of 2017. Abreu made his U.S. debut in July of 2016 against veteran Jake Giuriceo and recently faced former world kickboxing champion Enriko Gogokhia and former international title-holder Madiyar Ashkeyev. His last three opponents boast a combined record of 35-0, including current WBA international champion Kerman Lejarraga. 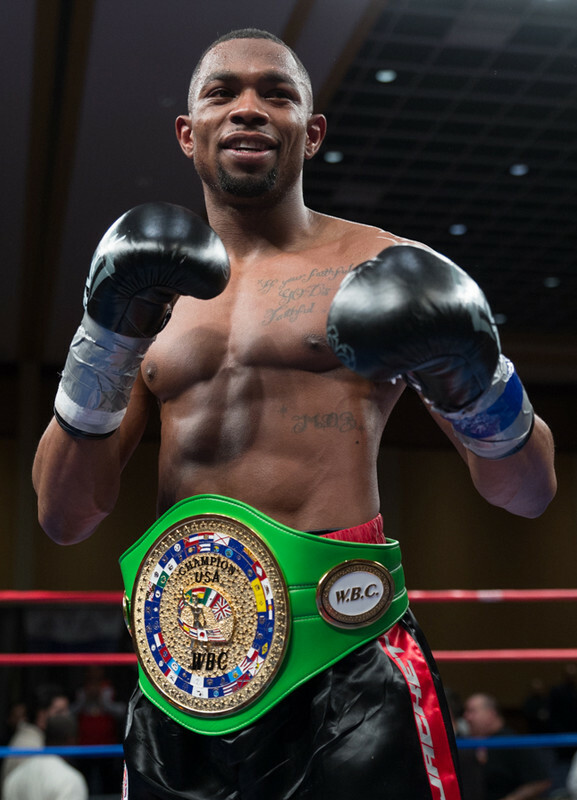 Foxwoods also welcomes back unbeaten Worcester, Mass., middleweight Kendrick Ball Jr. (9-0-2, 6 KOs), who faces undefeated 23-year-old prospect Alexis Gaytan (3-0, 2 KOs) of Weslaco, Tex., in a six-round showcase. Ball fought outside of Rhode Island for the first and only time in his career in July of 2016 in a draw against Connecticut’s David Wilson. The always-busy Ball Jr. returns for the first time since December after opening his pro career with 11 bouts in 19 months. Female bantamweight Marcia Agripino (1-1-1), born in raised in nearby Ledyard, ends a five-year drought at Foxwoods when she faces California’s Kailyn Hansen (0-1) in a four-round bout. Agripino’s first and only bout at the Fox Theater in November of 2013 ended in a draw against Michelle Cook. A certified surgical technologist at Lawrence + Memorial Hospital in New London, Agripino returned to the ring for the first time in four years in September against New Yorker Federica Bianco in Rhode Island. Making his CES Boxing and Foxwoods debut, New Haven super middleweight Elvis Figueroa (4-0, 2 KOs) faces Leandro Da Silva (1-1, 1 KO) of Sao Paolo, Brazil in a four-round bout. An eight-time UFC vet with 27 professional MMA fights under his belt, Da Silva earned a landmark victory in May 11th in Rhode Island, knocking out Jake Paradise of Massachusetts for his first win as a pro boxer. This is his second appearance at Foxwoods and first since August. Figueroa trains alongside Soto at New Haven’s Boxing In Faith Gym, owned and operated by managers Luis and Marilyn Rosa. A highly-decorated amateur, Figueroa advanced to the finals of the 2016 Olympic Trials, where he faced Jonathan Esquivel of Anaheim, who is now 5-0 as a pro. On the amateur portion of the fight card, 156-pounder Isaiah Mendez of Providence, R.I., faces Todd Chattelle Jr., of Pawtucket, R.I., and B&F Boxing; Noor Rahmanhy of New Bedford, Mass., and All Out Fitness battles Donald Jones Spann; and Tristan Penha of East Providence, R.I., and 401 Boxing faces Angel Martinez of New Haven and Elephant In The Room in a rematch. Also, 12-year-old Jeffrey Nunez Perez Jr. of New Bedford and Stay Ready Gym faces Michael Guadreau of Fall River, Mass., in a 105-pound bout; and Kelsey Kaiser of New London, Conn., squares off against Michelle Egan. Fighting out of the Big Six Boxing Academy in Providence, Christian Figueroa takes on Golden Gloves silver medalist Felix Parrilla of Hamden, Conn., in a 126-pound bout. Chattelle Jr. is the son of former CES MMA champion Todd Chattelle. Foxwoods Resort Casino is the premier resort destination in the northeast. As the largest resort casino in North America, Foxwoods offers a vast array of gaming in seven casinos; AAA Four-Diamond hotels, restaurants from gourmet to quick service, world-renowned spas, award-winning gold, state-of-the-art theaters, and exclusive retailers. Perfect for both recreation and business, Foxwoods provides modern and versatile convention and meeting space to infuse life into any meeting or event. Foxwoods Resort Casino is owned and operated by the Mashantucket Pequot Tribal Nation.